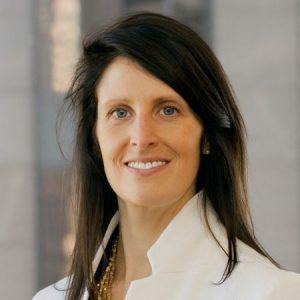 Jillian DelSignore is head of ETF Distribution at J.P. Morgan’s Asset Management business and is responsible for leading the sales efforts and strategy in the intermediary and institutional markets. She has also been recently appointed co-president of Women in ETFs. Jillian sat down with Jobs in ETFs to share her career journey and tips on how to make it to the top as a woman. Jobs In ETFs (JE): Can you explain briefly how you progressed your career and what your roles involved? DelSignore: I have spent the vast majority of my career as a salesperson and have had the opportunity to work with nearly every type of client from retail advisors to RIAs to institutions. It provided me with a unique lens into so many parts of the industry and how the usage of ETFs can differ from client to client. After spending about ten years in external sales, I joined JPMorgan in my current role as Head of ETF Distribution. It was an amazing opportunity to be a part of building a new business within one of the most respected Asset Managers in the industry. JE: What does your typical day look like and what are you enjoying most about your new role? DelSignore: One of the things I love so much about my job is that every day is a bit different. As Head of ETF Distribution, one of the things I have responsibility for is managing a team of ETF sales specialists who spend their time working with advisors and institutional investors educating on all things JPMorgan ETFs. Working with my team and spending time with our clients is an exciting part of my day to day. I am also on the ETF Management team so am involved in interesting strategy discussions on our distribution, marketing, product and broader initiatives as we look at different ways to grow the business. Over the last two years I’ve also spent a good bit of time with the media talking about our client and products trends as well as our business growth. The days are never the same but always interesting! JE: What were some of your most important career turning points? DelSignore: When I reflect back on my career so far, three events strike me as big turning points. The first was very early on just a few years out of college when I made the decision to move into sales. It was actually my father who helped me recognize that I thrive and get true enjoyment out of working on a team and being in front of people (clients) each day. It was then that I made the decision to move away from a career that would’ve been more portfolio management focused to client and sales focused. Father knows best! The second was my move into the ETF industry in early 2009. I wish I could say I knew then that the industry would grow the way it has but at that point I was still a bit green frankly. It was more about joining an exciting “new” industry at the time and a team of people I really enjoyed working with. Sometimes you just have to trust your gut, jump in and then work really really hard. The head of the team I joined became my sponsor and biggest influence in my career. She believed in me and my abilities which was so much of what propelled me forward during those early years. Needless to say, that was a big turning point for me. After years on that team and gaining meaningful experience about the industry and all sorts of clients, I had the opportunity to come to JPMorgan in a leadership role. Joining this team was equally as big a turning point because it was an opportunity to build not only a team but a business. It was an incredible opportunity to be a part of something new, a part of building what we all knew would be successful but not without a lot of hard work. JE: What do you look for in the people you hire? Entrepreneurial spirit- this was and is a new business for the firm and having that fire in the belly to own his or her own business was critical. You have to want to be a part of a team that is growing and changing rapidly. Team focused – this is incredibly important at any stage of a business or one’s career. Someone on my team has dozens of partners he or she works with day to day not even including those on our own team. Successful partnerships and embracing teamwork can have a large impact on someone’s long term success. Adaptability – one of the things that is certain in life is change, especially in a growing business. In a new business you wear a lot of hats and your job is likely to evolve as the team grows so finding people comfortable with that change is important. JE: Is having a mentor important? Did you have one or were you a mentor to anyone? DelSignore: I think having a mentor is very important in one’s career. I have been lucky enough to have a few mentors in my career and one key sponsor. Something that is often overlooked is the difference between a mentor and a sponsor. A sponsor is more someone who extends her or himself or has something on the line to help you expand your career opportunities versus only providing advice. It’s an important distinction and both can play important roles in your career. I try to pay it forward whenever I can and have mentored a number of women and men over the years. All of those have happened naturally through our regular interactions either through the firm we worked for or through Women in ETFs. In my experience natural mentorships tend to be more effective. Not that those that are manufactured can’t work, but my experience has been better in those that evolve naturally. In addition to mentors or sponsors, I’ve found peer advisors to be important in my career development. This is someone who is in a similar stage in her career and is perhaps going through a similar change or milestone. Talking through your unique challenges during that time can be incredibly valuable. JE: Throughout your career, how did you know it was the right time to move roles/companies? DelSignore: Honestly, I don’t know that you ever really know with complete confidence that it’s the right time but you have to follow your gut- or at least that’s what I’ve done. I’ve focused on not only the job opportunity but also the people and culture of the organization or team. I wanted to find opportunities that provided a runway for growth and something that challenged me each day. This is also where a peer advisor can be very helpful as an outside observer helping you think objectively about specific opportunities. DelSignore: I would tell them to take the risk. Jump in with both feet if it feels right to you. I would also tell them to be adaptable. It is still a young industry relatively speaking and things are changing rapidly. You can absolutely find the opportunity to grow in the industry if you allow yourself to ebb and flow with what comes to you. JE: You spoke at the Annual Women in ETFs breakfast at Inside ETFs in Florida. What was the core message of your presentation/discussion? DelSignore: As the incoming Co-President of Women in ETFs this year, I had the opportunity to moderate the panel at our annual Inside ETFs breakfast. The conversation with Lynn Blake and Jenny Johnson covered a lot of important topics including the impact of women in the c-suite and the importance of gender diversity on an organization. Something that has evolved out of that event is the Women in ETFs Speakers Bureau. Women are woefully underrepresented on panels at industry conferences and instead of just talking about it, we decided to do something about it by creating the Speakers Bureau. It contains the names of women throughout all parts of the industry who can speak as experts to any variety of topics- distribution, product, capital markets. We have spent time with some of the conference organizers to commit to improving the numbers together over the next 18 months. It is on all of us to work to get there. DelSignore: I think about this time in the ETF industry as the beginning of the next chapter. There have been a lot of new entrants into the business over the last half decade and you’ve seen interesting product development follow in areas like factor investing as example. There is still white space that an asset manager like JPMorgan can help fill in areas such as fixed income and alternatives. We hear from clients that those are exposures where they still would like to see differentiated products- either active or non-market cap weighted. I think it is those providers who bring strong investment capability to the market who will ultimately lead in writing this next chapter.